When I started reading 'Ice' I had absolutely no idea what I was in for. It was in fact an amazing love story and an adventure story of the highest caliber. It is loosely based on the Norwegian tale, East of the Sun, West of the Moon, with a huge dollop of Beauty and the Beast thrown in for luck. We all know the story of Beauty, but not so many of us know the story of East of the Sun. Click HERE if you would like to see the Wikipedia explaination of it and HERE is the link for the story from Andrew Lang's Blue Fairy Book. That said, 'Ice' is a fairy tale all on its own. The main protagonist, Cassie, is a modern teenager with a strong will and an amazing portable GPS system. Her adventures on the ice of the Arctic are nothing short of astounding. She has been brought up in the Arctic by her father, believing that her mother died when she was young. When she meets a talking polar bear on the ice, everything that she believed is questioned. At first I had a bit of a problem with the whole human/polar bear interaction, but I soon got over that and just enjoyed the adventure. Ms Durst tells us HERE that she wrote the story as a love letter to her husband - all I can say is she must love him very much indeed. Would that we could all experience that kind of devotion for someone. 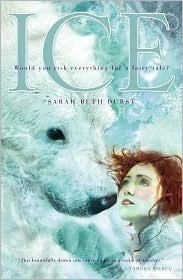 For fans of fairytales, or just good love stories, you can't go wrong with 'Ice'. Now I can't wait to try Ms Durst's newest book, 'Enchanted Ivy'. If it's even half as good, I'm sure I'll love it. I remember reading this a while ago and really enjoying it. I was fascinated by the Ice Castle and really liked Cassie as a main character.